As ships are moored or anchored in this port, you will be tendered ashore. Maiao is an 8.8 km² (3.4 sq. mi.) 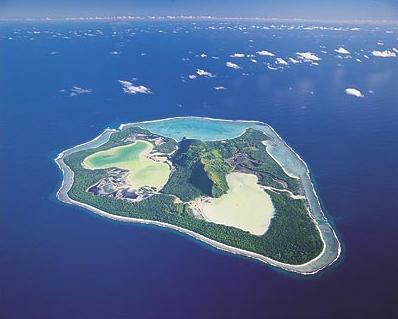 island formation located 78 km (48.5 miles) southwest of Moorea and one of the Windward Islands (French: Îles du Vent) in French Polynesia. The island formation consists of one high island with a peak elevation of 154 meters (505') and a low island (or motu) that winds along the base of the high island. The formation encloses two hypersaline endorheic lagoons called Roto Iti and Roto Rahi. The island also has a lagoon at its edge. All lagoons are connected through narrow channels. The island is home to around 300 people. 1000 CFP francs = 8.38 euros.